In 1950 California, Don Edwards and I became high school classmates – our graduation class numbered fourteen. During our college years of the mid-50s we went our separate ways and did not reconnect until the mid-1990s. Though we lived thousands of miles apart, we became inseparable using email communication and sharing blog posts until Don passed away on August 15, 2011. The common denominator of our renewed friendship was our six years of shared experience living a religious monastic life – followed by a lifetime of recovery. 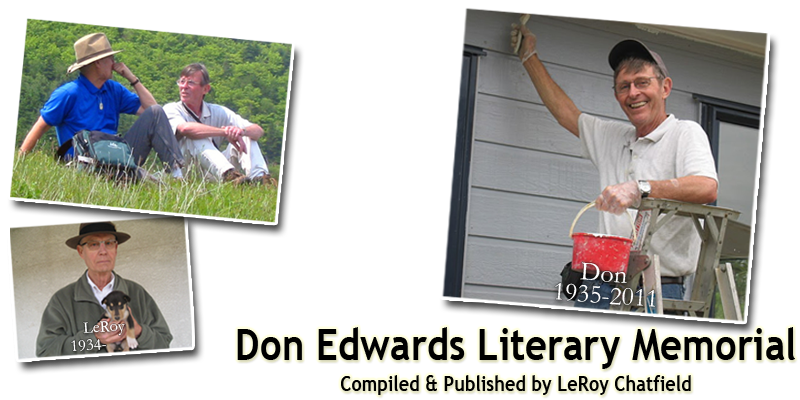 The purpose of this website publication – Don Edwards Literary Memorial – is to collect the stories he wrote, his opinion pieces, the posts to our blog along with some of the essays and commentary I wrote – sometimes in response and sometimes not. The passing of my friend, Don Edwards, is such a personal loss for me no recovery is possible. This website devoted to his literary work (and mine) will have to suffice.